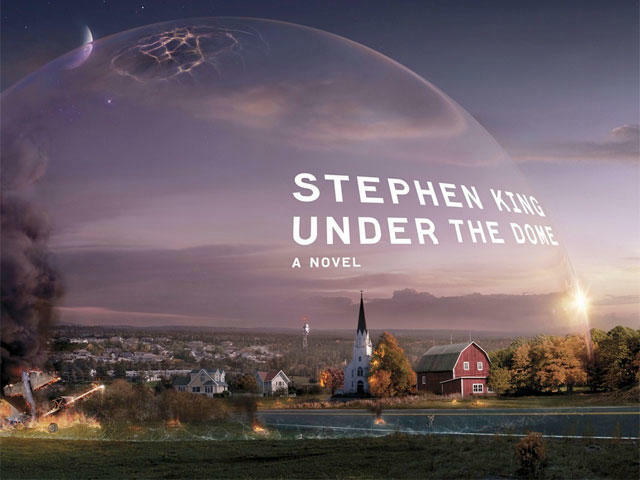 Amazon has announced that it will be the exclusive streaming and download provider for the upcoming Stephen King television series, Under the Dome. In a bold move by Amazon, it has secured exclusive online video rights from CBS to the upcoming Under the Dome mini-series based on Stephen King's novel of the same name. The story focuses on a town trapped under a mysterious dome that no one can pass through. The plans call for the 1,074 page novel to be turned into 13 episodes. Under the deal between Amazon and CBS, the streaming provider will be able to run episodes four days after they air on television for their Amazon Prime customers. At the same time, the service will be the only place online where you can purchase or rent episodes. "Amazon has the distinct combination of having a terrific video service with a huge fan base among their customers for Stephen King's book, making them the perfect partner for this summer programming event," said Scott Koondel, Chief Corporate Content Licensing Officer, CBS Corporation. "With this innovative agreement, we're giving fans more options to watch and stay current with this serialized series, and doing so in a way that protects the Television Network's C3 advertising window." With all of the movement lately at Amazon with deals such as hiring banner actors for its own productions, and securing exclusive rights to hit series, it's looking more and more like Amazon Prime is a video service that provides free shipping as opposed to the other way around. LOS ANGELES & SEATTLE–(BUSINESS WIRE)–Feb. 11, 2013– CBS Corporation and Amazon.com, Inc. announced today a content licensing agreement for the new CBS television series Under the Dome, establishing an in-season, online subscription-video-on-demand (SVOD) window for the show on Amazon's Prime Instant Video service. Prime Instant Video will be the exclusive online subscription home for Under the Dome. The serialized drama from Steven Spielberg's Amblin Television, based on Stephen King's best-selling novel of the same name, will premiere on the CBS Television Network on June 24, 2013. Amazon Prime members will have unlimited streaming of all the series' episodes four days after their initial broadcast on CBS, at no additional cost, and will be able to enjoy them on hundreds of compatible Amazon Instant Video devices including Kindle Fire HD, iPad, iPhone, iPod touch, Roku, Xbox 360, PlayStation 3 and the Wii U gaming console. Episodes of Under the Dome will also be available for purchase and download exclusively at Amazon Instant Video (www.amazon.com/AIV). Under the Dome tells the story of a small New England town that is suddenly and inexplicably sealed off from the rest of the world by an enormous transparent dome. Under the Dome earned widespread critical acclaim and #1 best-seller status when it was first published by Simon & Schuster'sScribner in 2009 and was an Amazon.com bestseller in both Books and Kindle Books in 2009. "Amazon has the distinct combination of having a terrific video service with a huge fan base among their customers for Stephen King's book, making them the perfect partner for this summer programming event," said Scott Koondel, Chief Corporate Content Licensing Officer, CBS Corporation. "With this innovative agreement, we're giving fans more options to watch and stay current with this serialized series, and doing so in a way that protects the Television Network's C3 advertising window." "With creative forces of Stephen King and Steven Spielberg's Amblin Television behind Under the Dome, we think our customers will love this new show and we're excited to be able to offer this highly-anticipated series at no additional cost to Prime members," said Brad Beale, Director of Digital Video Content Acquisition for Amazon. "Adding a current season major network TV series like Under the Dome to the Prime Instant Video library so shortly after its live airing enables us to increase our exclusive selection of great TV shows and give customers access how, when and where they want to watch it." Just last week, Amazon announced that Prime Instant Video will soon become the exclusive online subscription home for PBS hit Downton Abbey. The Prime Instant Video library now features more than 36,000 movies and TV episodes including fan-favorite shows such as Downton Abbey,Fringe, and The West Wing and blockbuster movies including Mission Impossible: Ghost Protocol, Rango and Transformers: Dark of the Moon, for Amazon Prime members to stream, commercial free at no additional cost on Kindle Fire HD, iPad, iPhone, iPod touch, Roku, Xbox 360, PlayStation 3, Wii and Wii U, among other devices. To sign up for Amazon Prime, visit www.amazon.com/primeinstantvideo. Under the Dome is produced by CBS Television Studios in association with Steven Spielberg's Amblin Television. Neal Baer, Stephen King, Justin Falvey, Darryl Frank, Stacey Snider and Brian K. Vaughan, who wrote the television adaptation, will serve as executive producers. Acclaimed director Niels Arden Oplev will direct the first episode.